Dickeya blackleg, often just called Dickeya, is a new disease in the USA. It is caused by the bacterium, Dickeya dianthicola. This aggressive pathogen has the potential to cause more severe losses than species of Pectobacterium (aka Erwinia) causing the type of blackleg that has been occurring. High temperatures (exceeding 77 F) are favorable for Dickeya, consequently the greatest losses have been in the southern portion of the northeast (especially the mid-Atlantic region) and further south. 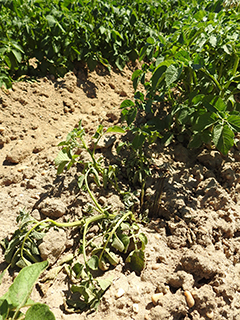 Total crop loss has occurred. Dickeya was severe in 2015 at least partly reflecting hotter weather than previous 2 years when the pathogen likely was present. This new disease is developing again in 2016. Symptoms. 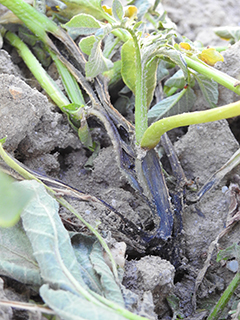 First symptom is poor emergence (skips in a production field) due to rotting seed. 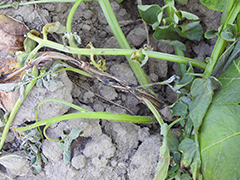 Plants that emerge from contaminated seed wilt and typically have black stems extending upwards from rotting seed piece. Occasionally, especially late in the season, only internal stem tissue will be discolored. 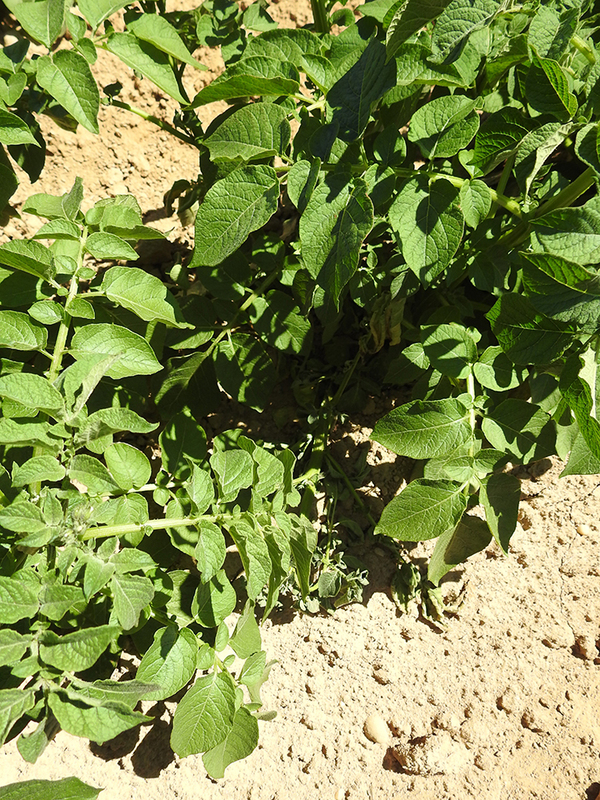 The fact stem symptoms start at the seed and progress upward illustrates that Dickeya dianthicola is in potato seed. 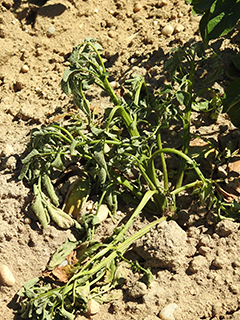 Symptoms typically develop following a period of hot weather especially when plants are also stressed. In 2015 on Long Island a lot of plants dropped out during flowering. 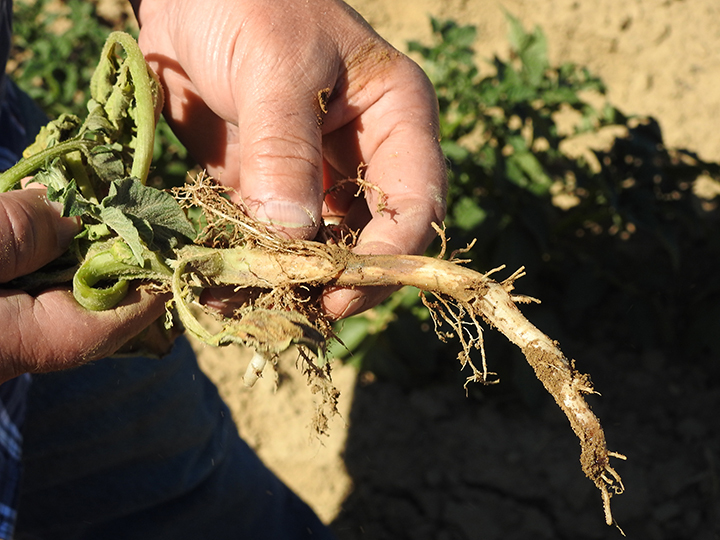 Blackleg caused by Pectobacterium differs from Dickeya in that it starts on the outside of stem tissue, infects through wounds, and then moves downward as well as upward causing stem rot that is dark brown. Affected tissue typically has an offensive odor and is slimy. In contrast, plant tissue affected by Dickeya typically has an earthy smell; occasionally it has an offensive smell indicating soft rot bacteria are also present. Plants affected by Dickeya can just appear unthrifty if they have a sub-lethal titer of the bacterium. No symptoms may develop when the temperature never becomes hot during the growing season. Management. 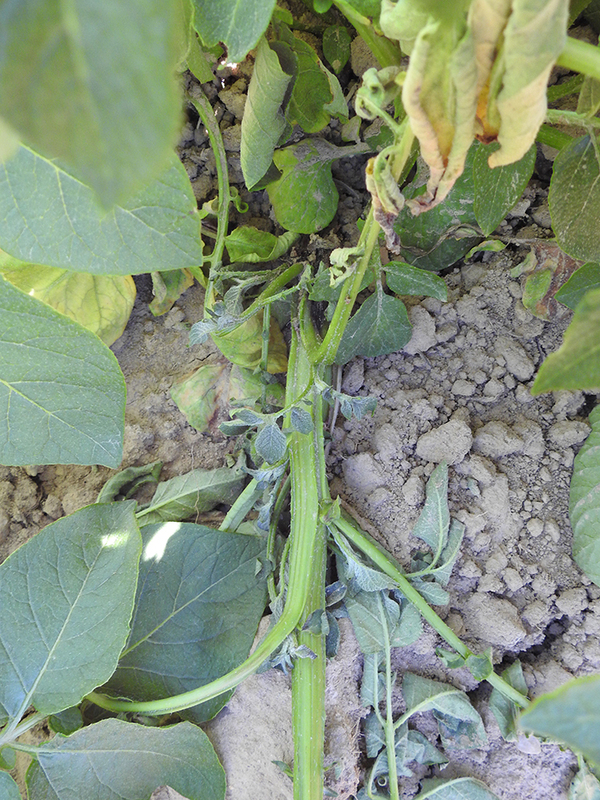 Dickeya is a destructive pathogen that cannot be managed when present in production fields. There are no resistant varieties and no effective fungicides. This bacterium is not known to be able to survive in soil more than about two months, which is not long enough to be able to serve as a source of inoculum the following growing season. Research is underway to try to confirm this under a range of conditions. Potato seed that is free of Dickeya is the best management practice for this disease. 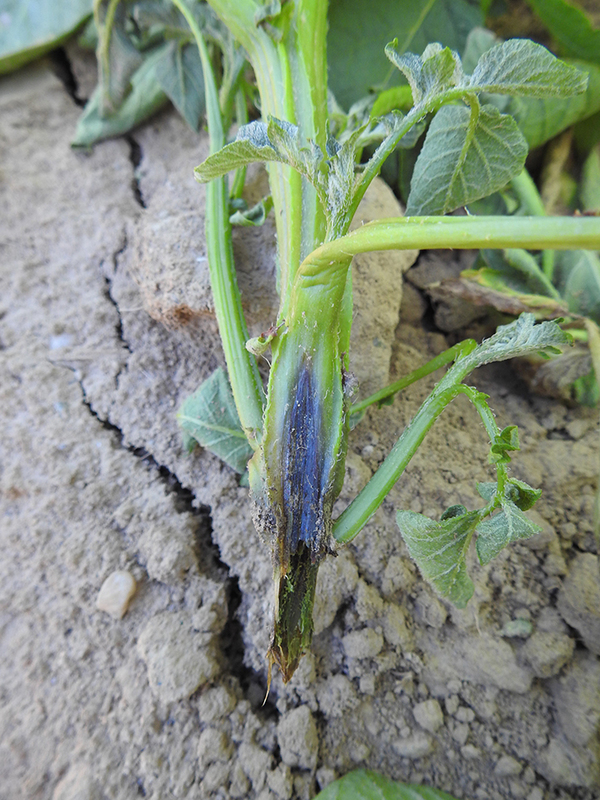 One challenge is that symptom development is limited by cool temperatures that are typical in seed producing areas: the pathogen can be present in a plant but cause no distinctive symptoms (wilt or black stem). Unfortunately there is not a reliable seed testing procedure identified yet. 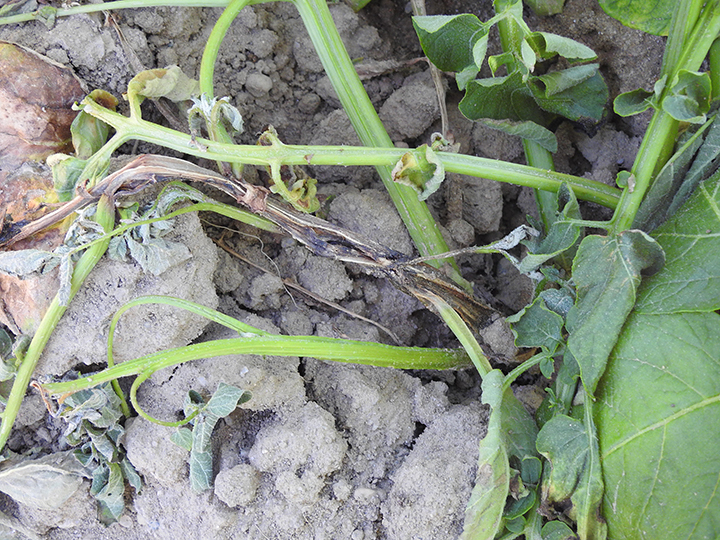 Infected seed can appear healthy. 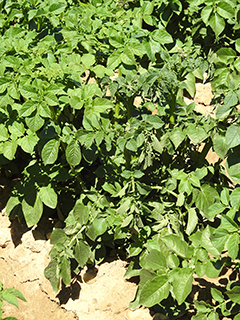 Dickeya is developing in crops established in 2016 with seed that tested negative with the dormant tuber test. There is differing opinion about whether there should be no tolerance for Dickeya, similar to bacterial ring rot, in certified potato seed or whether a low percentage of contaminated seed can be tolerated as is the case with other diseases such as late blight. A major difference is that there are resistant varieties and effective fungicides for managing late blight. 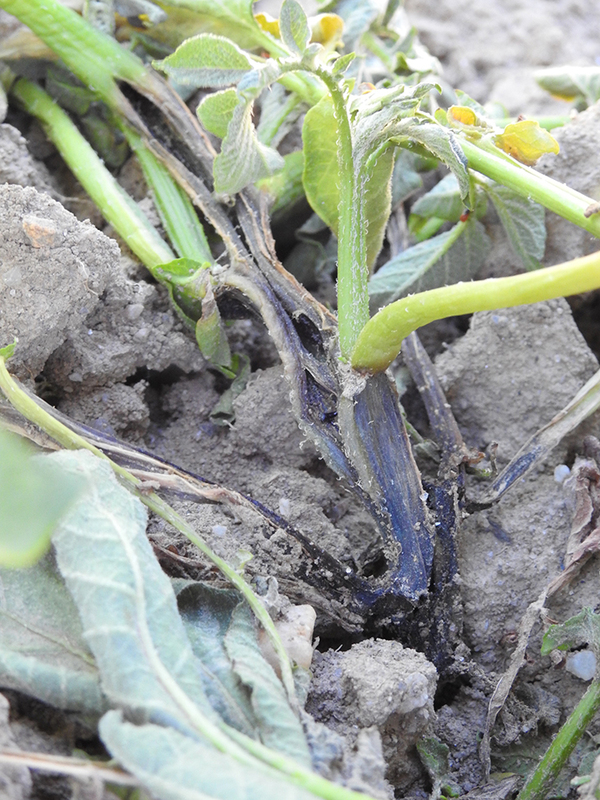 Collapsed plant with Dickeya black stem symptoms that was hidden by healthy neighboring plants. 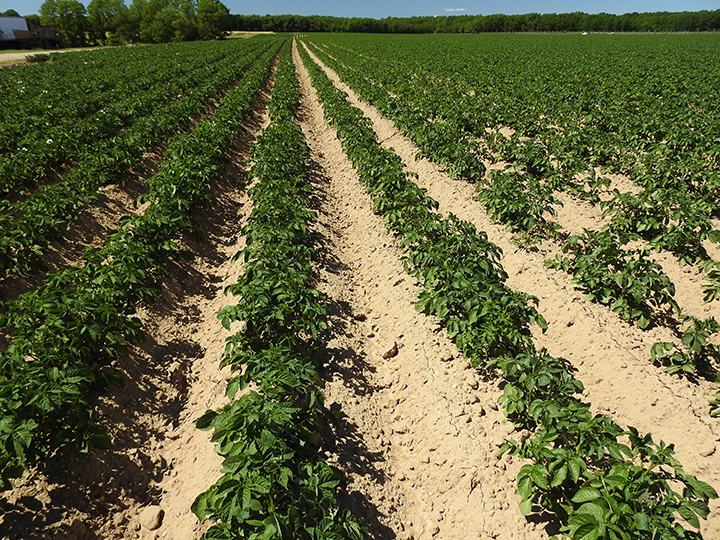 Field planted with Superior potato seed from two sources. Poor emergence and other symptoms of Dickeya only found for one seedlot (right side of top left image).